In winter the Ruff has dark back feathers edged with ochre on it's upperparts, giving a scaly affect. Markings are variable from bird to bird. The female is very similar to the male in winter but is slightly smaller. Male Ruff in winter betray their extraordinary appearance in spring when they develop a broad feathery 'ruff' around the neck. 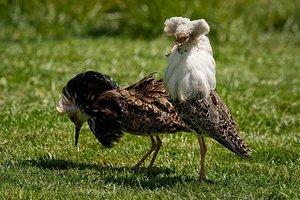 The display and mating of the Ruff takes place at a 'lek'. Several groups of birds will gather and fight for dominance. The strongest birds managing to breed with the females. 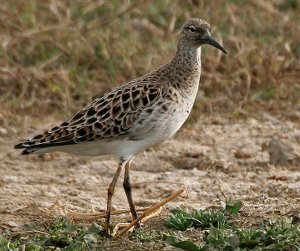 Whilst the colour of the Ruff's neck feathers may vary, it's unlikely to be confused with other birds. These two male birds are challenging each other on a 'Lek'. 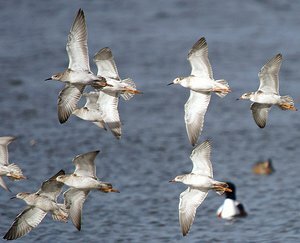 This image shows a flock of Ruff in winter plumage. Note the light undersides and the distinctive head shape. Bills are usually black however you will note two in this image, with yellowish bases to the bill. 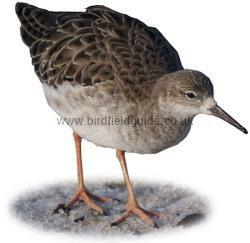 This image shows the typical posture of a Ruff, small head, pot-belly, humped back appearance. Note the light feathers around the base of the bill a common feature in winter birds. 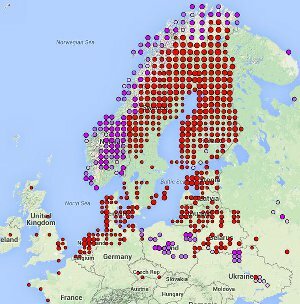 Most widespread in North East Europe. In the UK it is a rare breeder, it is most often seen as a winter visitor or on passage. Usually nests in wet grassland. In winter is most often seen around the edges of muddy freshwater pools. 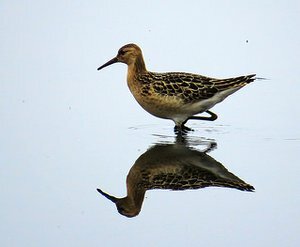 Ruff in winter plumage feeding. The Juvenile bird is similar to adults in winter plumage however, it's breast, neck and head are ochre-buff and it's underside is pale white. Note the ochre edged back feathers which are the same colour. 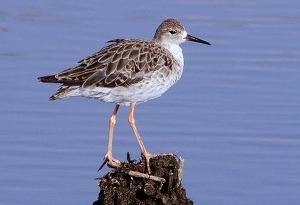 The female Ruff in summer lacks the neck feathers of the male. Her back shows many dark feathers edged in ochre, and her neck and breast has black speckling. When seen with the male she is visibly smaller.